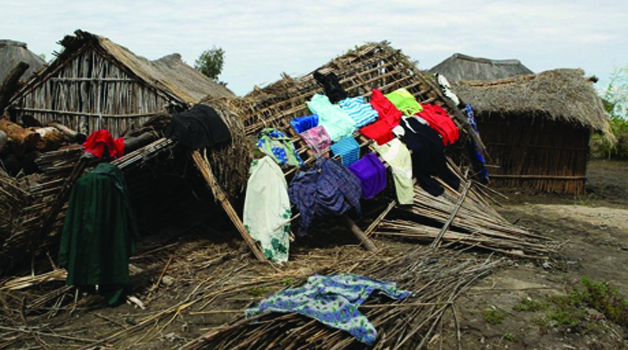 Over 31 houses in Kapona village of chief Mumena’s chiefdom in Kalumbila district in North-Western Province have collapsed due to heavy rainfall. Kalumbila District Commissioner, Robinson Kalota undertook a tour of the area with a delegation of District Disaster Management and Mitigation Unit (DMMU) committee after being alerted by Chief Mumena yesterday. Chief Mumena told the delegation during a courtesy call at his palace that he was worried about the elderly and children being crowded in the remaining standing structures and the safety of drinking water as it could easily be contaminated owing to the flooding. Kalota assured Chief Mumena that the district DMMU committee would work tirelessly to contain the situation. He however, expressed disappointment at elected leaders in the area for failing to report the disaster on time. And Sub-Chief Kapona of the affected village was grateful to the district commissioner and his entourage for visiting the area. Meanwhile, one of the affected residents, Jackson Kabemba disclosed that 53 houses had cracked due to too much moisture while 31 houses and 31 toilets had collapsed so far.